Christian Media in Nigeria : Don't Miss Praiseworld's Praise Party in Ilorin! 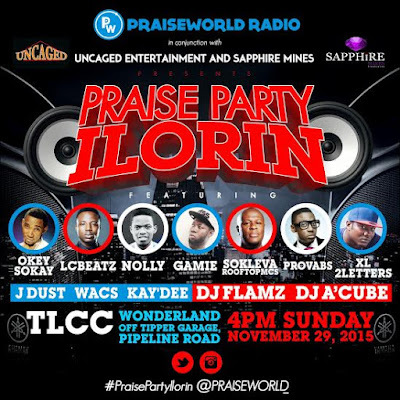 Don't Miss Praiseworld's Praise Party in Ilorin! Praiseworld Radio, in conjunction with Uncaged Entertainment and Sapphire Mines is set to storm Ilorin come Novemeber 27 for 'Praise Party'! Among those joining the Praiseworld crew for this edition of the Praise Party series are Okey Sokay, Gamie, Nolly, LC Beatz, Provabs, XL 2Letters, and of course, Africa’s legendary gospel rapper and lyricist, the prolific Sokleva Hughes of the Rooftop MCs. Other gospel artistes such as J Dust, Wacs, Kay’Dee will also be present. Celebrity DJs from the city of Lagos; DJ Flamz and DJ Acube will be spinning the wheels of steel, churning out sounds that will leave the crowd pumped. 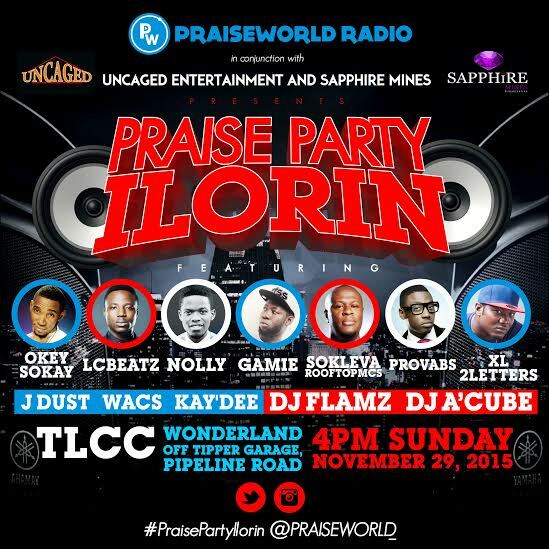 Praise party will hold live at TLCC Wonderland, off Tipper Garage, Pipeline Road, Ilorin and it starts at exactly 4pm!